Squash risotto usually doesn’t have a whole lot of squash flavor – so much so that this almost landed on the clunker pile. At the last-minute I found this gorgeous recipe that uses Pumpkin Broth so it captures that elusive squash flavor in spades – Genius I tell you! It takes a little extra time but it’s well worth it, and unlike most dishes, it doesn’t taste as good the second day. There are also some delicious add-ons that you can stir in at the end – I tried them all, but the photographs are before that – fresh mozzarella and arugula makes for a gooey, glob of deliciousness – but not a great photograph. Let simmer for 30-40 minutes add more spice if you think necessary. While the broth is simmering for the last 15-20 minutes you can start on your risotto. I found that it was much easier to strain the broth as I needed it instead of all at once. This meant that as I was stir, stir, stirring the risotto, the next cup of broth was straining. This way I didn’t have the urge to squish it through the strainer in turn getting pure broth and no puree – ideal. Keep stirring and adding a cup of the warm broth at a time and having it completely absorb before you add the next cup. You should end up doing this a total of 6 times and possibly a little more depending upon how much liquid you can strain. 3 Tbsp Butter – glorious butter! ← Peanut Butter Pie – Oh My! 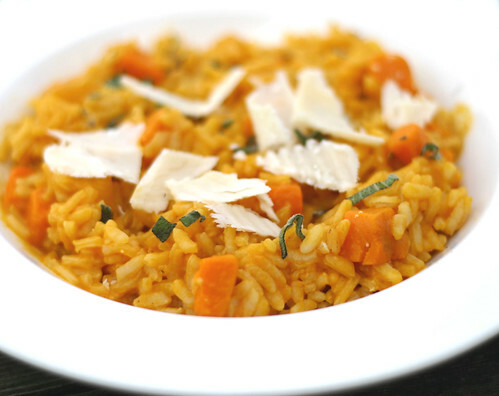 I love the idea of pumpkin broth and the resulting risotto sounds excellent! i am a huge fan of pumpkin especially in the fall. i love the idea of this! Looks delicious! I love the photo at the top of the post. Brilliant! Time out! Allspice is a berry?? No kidding! When I see it dried and ground up in the store, I always think it’s a combination of other spices, like curry powder. There’s the power of language for you, I guess. Tasty picture! Thanks for sharing. Pumpkin Broth!? Ingenious! Must try that sometime soon. this looks delicious! i was wondering though…i have a pie pumpkin i’ve been wanting to use so do you think i could just puree that to 15 oz or should i prepare it somehow first? I think that would be splendid! Just cut it up in small pieces and cook along with your other veggies in the broth then maybe mash them as you go along – or not – just let the broth cook the FULL time or longer to get maximum amount of flavor. Don’t forget to save some larger diced pumpkin for the risotto half of the recipe. Let me know how it turns out if you do try it. I’m a fan of just about anything pumpkin or risotto. This looks sooo good!!! I love pumpkin…I love risott…wait a minute…this is the perfect recipe for me! This recipe warms up my insides…can’t wait to make it! Hi Mary! Glad to see you’re still blogging. 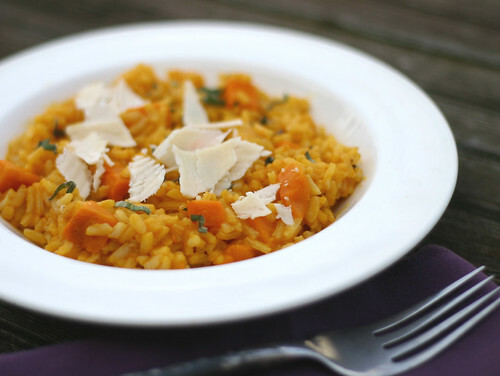 This pumpkin risotto sounds amazing!